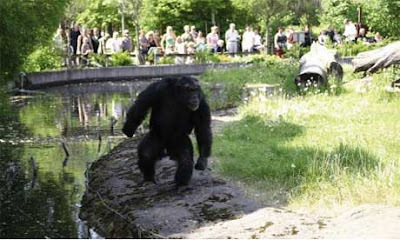 Santino, a captive chimpanzee, stockpiles rocks to throw at humans who laugh at him at the zoo. This was a big enough deal to advance the career of Mathias Osvath, who has studied Santino and concluded that Santino has foresight. If Santino's aim was a little better, maybe Santino's "human" characteristic would have been recognized earlier. Santino spends his days held captive in a zoo near Stockholm. Stockholm is a long way from equatorial Africa. In late December, there are only about 6 hours of sunlight in Stockholm, about half the length it would be at home. It's also a bit colder in Stockholm than Tanzania. Don't you love human interest stories? Human knowledge advances, Osvath is one step closer to a professorship, and we get to laugh at our cousins. He was castrated in an attempt to calm him down a bit. Chimps who toss rocks put their own at risk. Puts a new spin on the word "humane." "I will show you fear in a handful of dust...."